LOVE. I have so much love and appreciation for Sawyer Bennett. 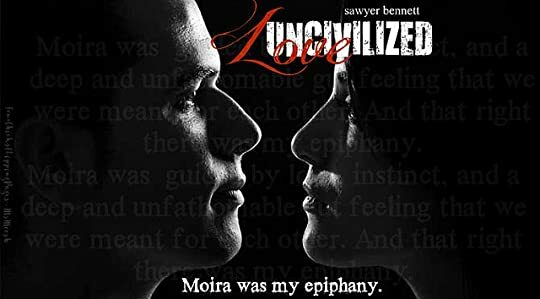 She simply is an amazing author who continues to write beautiful love stories and LOVE: UNCIVILIZED really captured this sentiment to the core. I love when authors surprises readers with a follow-up novella that allows readers to get a glimpse of what happened to their favorite fictional characters and I couldn't be more thrilled to catch up with Zach and Moira. Love takes place eight years later and Zach and Moira are happily married with their two beautiful kids but along the way, that sizzling connection that they shared had a few bumps along the way. Zach is constantly busy at work and staying late. He is missing out on quality family time. And Moira is a stay at home mom who misses teaching. As they go on through the monotone motions of life, they both realized that they need to get back that spark and connection that made them Zach and Moira. Can Zach and Moira reignite their devotion and love for each other? I absolutely loved this novella because it's so raw, honest and exposes the reality of any marriage. Zach and Moira could easily represent any married couple with children. Sometimes we got so busy with our work that we fail to see the really important things in life. Like quality time with the children and making more an effort to appreciate and be there for your significant other. I love that Ms. Bennett exposes that yes Moira and Zach are soulmates but they are humans who can easily make mistakes. But rest assured Zach and Moira still have that burning LOVE and spark to set hearts racing. What else can I say but go read this sweet, touching, and raw novella. Be prepared to fall in love all over again with Zach and Moira. Thank you Sawyer Bennett for this beautiful, uplifting and inspiring love story.